For the most part, my primary machine is still my trusty desktop PC. It’s got the most horsepower under the hood and I have all sorts of peripherals and accessories connected to it, like my dual monitors, my external hard drives, my USB headset and my webcam. But not that long ago, my main machine was a laptop, even though I still wanted a desktop-like experience in the office. If you’re in that camp, then you may be interested in the updated DS3900V2 Ultra Dock from the good people at Diamond Multimedia. As its name clearly indicates, the DS3900V2 is the second-generation version of the first-generation DS3900 docking station that we had previously reviewed. The core functionality remains largely similar, though they’ve packaged it up in a much more attractive-looking design. The two-tone look has been abandoned for flat black, for instance. 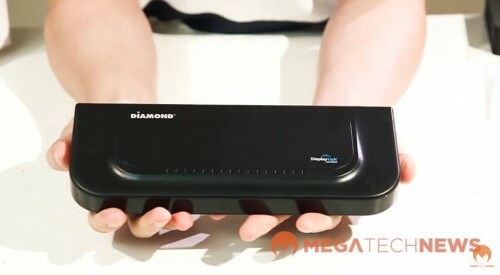 In the unboxing video below, I go over many of the most important features found on the Diamond DS3900V2, including how it differs from the original. You still get a range of USB 3.0 and USB 2.0 ports, as well as an RJ-45 gigabit networking port, a headset jack, and a couple of video-out options powered by the DisplayLink DL-3900 chipset. Yes, that supports full HD 1080p. Considering that the trend is moving toward increasingly fewer ports on our tablets and laptops, like what we’ve found on the new MacBook, having a docking station like the Diamond Multimedia DS3900V2 could prove invaluable. Look for the fuller written review in the weeks to follow.